Marlene Grindinger’s new book “UME” is an inspirational and captivating story about finding one’s inner self. Recent release “UME” from Page Publishing author Marlene Grindinger is a story of acceptance and friendship that teaches the lesson of being happy with one’s self. 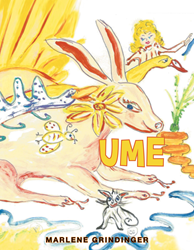 Marlene Grindinger, a devoted writer and author, has completed her new book “UME”: a cheerful and enlightening book that shows the reader that the world can be a wonderful place. She attributes her success to her ability to be a problem solver, a skilled communicator, a good listener, and a conscientious specialist with a wide range of resources. Published by New York City-based Page Publishing, Marlene Grindinger’s uplifting tale shows Ume’s journey and the wonderful place the world can be. Ume is about a little girl around the age of seven or eight. She is very simple -looking, with brown hair and, hazel eyes, and she is very skinny. During her first year at school, she found that schoolmates could be very cruel, and they made fun of her. Ume ran off into the woods and sat under a tree and cried. Out of the woods came a beautiful, blond, curly-headed, blue-eyed girl about Ume’s age and told Ume that her name meant “you and me”, and together, they were the same person. Off to the woods, they went and played, then ran in the water at the beach. They faced life together. Ume found that with her finding her inner self, the world was a wonderful place to live, and all ends very happy! Readers who wish to experience this inspiring work can purchase “UME” at bookstores everywhere, or online at the Apple iTunes store, Amazon, Google Play or Barnes and Noble.